During last weekend’s podcast, we discussed home field advantage and where it might come from. There is much literature to suggest that home field advantage comes largely from rowdy home crowds—crowds that both encourage the home team to be more aggressive and encourage the referees to be more biased—but you probably already presumed that. We went on to talk about “home specialists,” or teams that play especially well at home in a given season. An article on the site The Power of Goals theoretically explains why home specialists from any single season tend to be products of statistical noise rather than signal. That’s not to say there aren’t home specialists out there, only that it is nearly impossible to identify them statistically in a single season. Picking out the teams that have performed markedly better at home, and then retroactively seeking explanations to match the traits of those teams is known as cherry picking, and it’s likely to lead to false conclusions (On the podcast, I recounted an example from the book Naked Statistics by Charles Wheelan as to why this can lead to trouble). Instead, identifying traits of teams and stadia first, and then checking for measurable differences in home performance based on those traits is a more sound approach. We have mentioned around here before that Houston’s narrow home pitch might have helped the Dynamo to one of the best home records since BBVA Compass Stadium was built in preparation for the 2012 season. Indeed, Houston’s field is the narrowest in the league at 70 yards, and the Dynamo’s home goal differential is a whopping 1.33 goals better at home than on the road. However, the only reason we considered field dimensions was because Houston has performed so well at home. Field Dimensions --> Extreme splits? 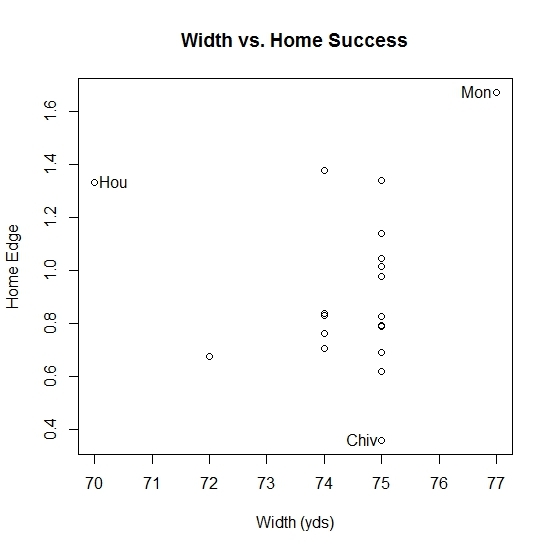 To advance the discussion, I gathered data going back to the 2010 season in order to look for explanatory patterns in two observable variables of stadia: field dimensions and surface. If teams are able to train on especially large or especially small fields, or on turf, such differences in the pitches may give home teams a leg up in matches played on those familiar pitches. 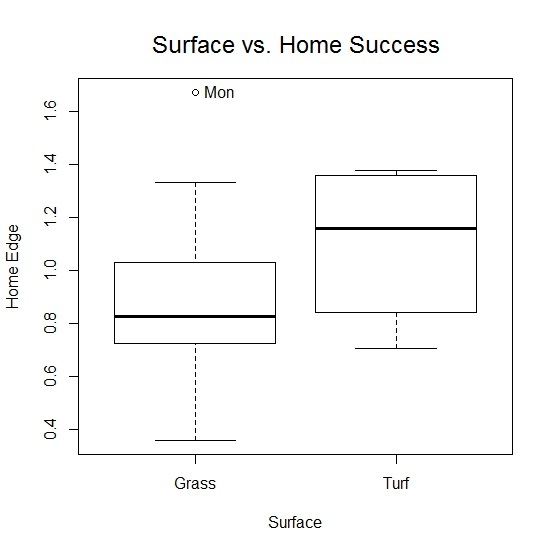 It turns out there is not enough evidence that either turf surfaces or field dimensions have much to do with home success. There are currently four teams that play on turf: Portland, Seattle, Vancouver and New England. While the Timbers and Whitecaps have dominated at home, The Sounders and Revs have been sub par relative to the league in that department. Considering I didn’t account for the confounding variable that two of these teams play in front of some of the rowdiest fans in MLS, the “turf effect” may not even exist at all. It’s hard to say with only four teams playing on turf, three of which are not even in their adolescence as franchises. Field dimensions showed minimal effects, as well. Though Houston’s small, 70-by-115-yard pitch has correlated with its home success, that correlation is not true of other small stadia. The next-smallest stadium can be found in Washington D.C.,** but DCU has actually performed a little worse at home relative to the typical league splits. Montreal has the widest pitch at 77 yards, and yet, also has performed well. There is a chance that teams with extreme widths—extremely narrow or extremely wide—have some sort of advantage, but we’re going to have to wait for additional data from Houston and Montreal to be more definitive about that. The vast majority of MLS pitches, 16-of-19 in fact, are either 74 or 75 yards wide. So even the two extremes in Houston and Montreal are not all that different. Houston could be a team built to play on a narrow pitch, but I’m skeptical that A) Soccer Analytics have come far enough for a general manager to sort that out and B) that 4-5 yards would make such a big difference. Though I can’t say for sure that the pitch effects are non-existent, I can say pretty confidently that they aren’t pronounced or noticeable in a single season. Right now, I would argue it’s more likely that Montreal and Houston have performed so well at home due to the random variation of only two seasons of data. We will have to wait another few seasons to check on that one. *Vancouver plays on Astroturf while the other three play on Field Turf. **DCU’s field at RFK is a little wider at 72 yards, and actually a little shorter at 110 yards.